You’ll be amazed by the possibilities for navigating the slopes other than on skis or snowboards. Allow your imagination free rein! Snowshoeing has a charm all of its own. Make your way through nature in slow motion and take in your surroundings to the full, in peace and tranquillity. The slow pace over soft snow also effectively improves your fitness and leg muscles. It’s always a great feeling when you reach your destination after an extensive snowshoe tour, especially as part of a group. Sledding is fun in the snow for young and old alike. Since time immemorial, winter lovers have enjoyed speeding down a splendid white slope on a sledge. It is particularly great fun when done in a group. A little race here, a daring leap over a bump there – with sledging, there’s something for everyone. 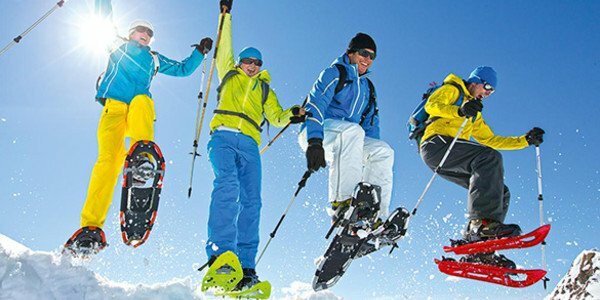 Would you like to be able to relive how you rocked the slopes after your skiing holidays? To share the unique mountain panorama and wonderful experiences with your family and friends on Facebook, Instagram, Twitter, etc? Then rent a helmet camera and preserve the best moments for ever. You can rent a camera and accessories at most INTERSPORT Rent shops. 1, 2, 3, action! Originally from the USA, the trend is now becoming established in Europe as well. From deep snow magic to carving or mogul piste – everything is possible with a snowbike. With a little practice, even non-skiers will soon get the hang of turns. Snowbiking means relaxation, lots of fun and whole-body training in the snow. Although bigfoot skiing is a somewhat older trend, it still has many followers. The skis are very short, barely longer than the ski boots, and are easy to control. Skiing is child’s play and you quickly get the hang of it. Snowblades are a little longer skis than bigfoots; they are especially suited to acrobatic manoeuvres and cool tricks and jumps.